Automated peritoneal dialysis (APD) is increasingly being used for the treatment of end stage renal disease. We present our experience of APD at a government run tertiary care institute. APD was initiated for 22 patients between 2002 and 2010. On comparing APD and continuous ambulatory peritoneal dialysis (CAPD) patients, no difference in patient survival and technique survival was observed. CAPD patients had higher number of peritonitis episodes, greater decline in the serum albumin and a greater number of patients failed to achieve adequacy targets compared to APD. Cardiovascular disease is the leading cause of morbidity and mortality in maintenance hemodialysis (MHD) patients. We evaluated the role of serum catalytic iron (SCI) as a biomarker for coronary artery disease (CAD) in patients on MHD. SCI was measured in 59 stable MHD patients. All patients underwent coronary angiography. Significant CAD was defined as a > 70% narrowing in at least one epicardial coronary artery. Levels of SCI were compared with a group of healthy controls. Significant CAD was detected in 22 (37.3%) patients, with one vessel disease in 14 (63.63%) and multi-vessel disease in eight (36.36%) patients. The MHD patients had elevated levels of SCI (4.70 ± 1.79 μmol/L) compared with normal health survey participants (0.11 ± 0.01 μmol/L) (P < 0.0001). MHD patients who had no CAD had SCI levels of 1.36 ± 0.34 μmol/L compared with those having significant CAD (8.92 ± 4.12 μmol/L) (P < 0.0001). 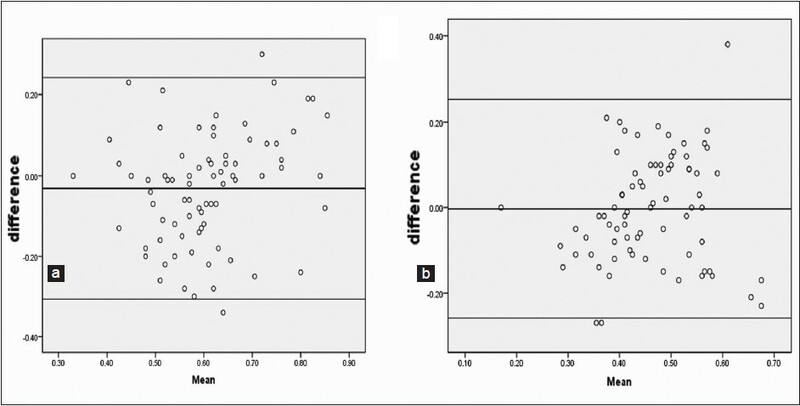 Patients on MHD and diabetes had stronger correlation between SCI and prevalence of CAD compared with non-diabetics. Patients having one vessel disease had SCI of 8.85 ± 4.67 μmol/L versus multi-vessel disease with SCI of 9.05 ± 8.34 μmol/L, P = 0.48. In multivariate analysis, SCI and diabetes mellitus were independently associated with significant CAD. We confirm the high prevalence of significant CAD in MHD patients. Elevated SCI levels are associated with presence of significant coronary disease in such patients. The association of SCI is higher in diabetic versus the non-diabetic subgroup. This is an important potentially modifiable biomarker of CAD in MHD patients. We prospectively followed-up new patients of tuberculosis while on maintenance hemodialysis at a State Government-run tertiary care institute. Between 2000 and 2010, 1237 new patients were initiated on maintainence hemodialysis. The number of patients diagnosed with tuberculosis after initiation of hemodialysis was 131 (10.5% of 1237). The age was 46.4 ± 10.4 (range 8-85) years and there were 90 (68.7%) males. The number of patients diagnosed with tuberculosis on the basis of organ involvement were: Pulmonary-60, pleural effusion-31, lymph node-21, meningitis-8, pericardial effusion-7, peritoneum-2, latent tuberculosis-2. The incidence of tuberculosis in hemodialysis was found to be 105.9 per 1000 patient years. Male gender, diabetes mellitus, past history of tuberculosis, mining as an occupation, low serum albumin, and duration of hemodialysis more than 24 months, and unemployment were found to be significant risk-factors on univariate analysis. Peritoneal equilibration test (PET) is an important tool for managing peritoneal dialysis (PD) prescription. The Kidney Disease Outcomes Quality Initiative (KDOQI) guidelines suggest that the first PET be performed 4-8 weeks after PD commencement. The main reason for this delay is because of the peritoneal membrane might change its character once it is exposed to the glucose based dialysate. In this study, we compared PET 2 weeks after PD commencement to PET after 6 months to evaluate the changes in the peritoneal membrane character with time. 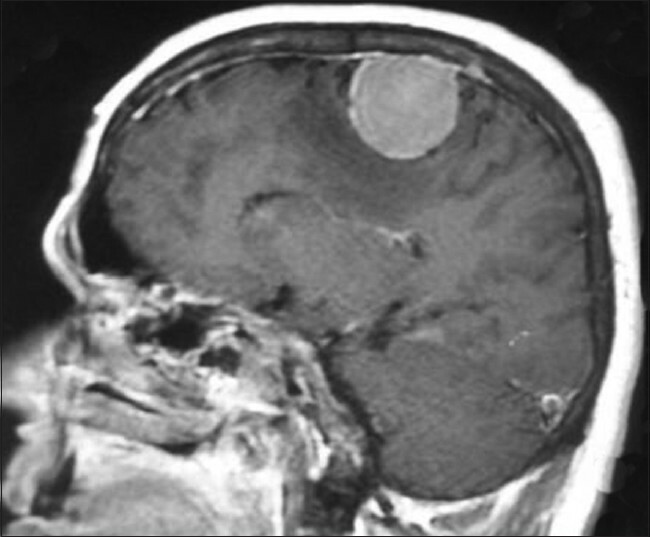 This study included 126 patients who underwent PD initiation between March 2007 and December 2011. The PET was performed as per the standard protocol at 2 nd week and 6 th month after PD initiation. Transport status was categorized as low, low average, high average, and high as per the standard definition. There was no change in transport character in 115 patients (91.2%) between the two PET measurements. When the Early PET at 2 nd week and 6 th month PET data were analyzed, no significant changes were observed in measured D/P creatinine (0.59 ± 0.14 vs. 0.62 ± 0.14 respectively P = 0.26) and D/D0 Glucose (0.46 ± 0.12 vs. 0.46 ± 0.11, P = 0.65). Using the Bland-Altman analysis the repeatability coefficients were 0.27 and 0.25 for creatinine and glucose values respectively. In our study, the PET performed at the 2 nd week are similar to that of the 6 th month PET in 91.2% of our patients and the test did not significantly change with time. In conclusion, we could do PET early at 2 nd week to assess the peritoneal membrane character and this would help in proper dialysis prescription to the patients. This study aims at examining the clinical impact, of antibodies detected on an ELISA mixed antigen tray format (LATM, One Lambda) in the absence of complement dependent cytotoxicity (CDC) positivity. All patients who underwent renal transplantation in 2007 and 2008 had their final pre-transplant sera retrospectively analyzed by the LATM assay. These patients were then followed-up with clinical, biochemical, and histopathological end points defined by elevation of serum creatinine and/or histopathological criteria. Among 164 patients who were studied, 149 received grafts from live related donors and 15, from deceased donors. 31 (19%) of the transplanted patients demonstrated pre-transplant anti-HLA IgG antibodies on the assay. Totally, 15 were positive for class I antibodies, 4 for class II antibodies, and 12 for both class I and class II antibodies. 44 patients (36%) experienced rejection. 8 out of 31 (26%) ELISA positive patients and 36 out of 133 (27%) ELISA negative patients experienced rejection. Among 15 patients who received deceased donor transplants, 4 were positive for ELISA, and 11 were negative. All 4 (100%) of the ELISA positive patients experienced rejection as compared to 3 out of 11 (27%) ELISA negative patients (P = 0.01). The ELISA LATM assay did not show any predictive value for rejection in our overall patient population; however, results in the specific setting of deceased donor transplants merit further exploration. Children with sickle cell disease (SCD) are plagued with incessant crises. There are few studies on the effect of sickle cell crises on renal function as determined by the glomerular filtration rate (GFR). This study was done to assess the effect of sickle cell crises on GFR during crises and after recovery into the steady state. GFR was assessed using the formula derived by Schwartz et al., for consecutive SCD patients aged between 3 and 18 years who came in crises and after recovery into the steady state. A total of 81 patients with a mean age of 9.95 ± 4.15 years in 81 episodes of crises met the inclusion criteria. Majority of the children (47) had vasooclusive crises, 19 had hyperhaemolytic crises, and 15 had features of both vasooclusive and hyperhaemolytic crises. The means value of GFR in ml/min/1.73 m 2 rose from 81.09 ± 22.92 to 116.24 ± 22.11 subsequent to recovery from vasooclusive crises into the steady state, from 77.45 ± 18.48 to 99.54 ± 17.71 following recovery from hyperhaemolytic crises into the steady state and from 90.95 ± 17.53 to 114.01 ± 22.44 following recovery from crises with features of both vasooclusive and hyperhaemolytic crises with corresponding significant P values of 0.000, 0.001, and 0.004 respectively. The reduced GFR observed during vasooclusive and hyperhaemolytic crises improved significantly following recovery into the steady state. Dyslipidemia is frequent in patients with end stage renal disease. Excessive peritoneal glucose absorption from high glucose-containing peritoneal dialysis solutions may enhance disturbances on the lipid metabolism of patients on peritoneal dialysis. We compared the effect of icodextrin-based peritoneal dialysis therapy with hemodialysis (HD) therapy on lipid metabolism. 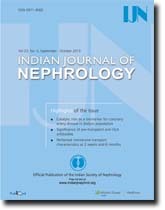 A total of 157 non-diabetic patients on dialysis at least for 3 months; 78 patients on Icodextrin-based continuous ambulatory peritoneal dialysis (CAPD) (44 M, 34 F) and 79 patients in HD group (47M, 32F) were included into the study. After 12 h of fasting and before the dialysis session, serum urea, creatinin, glucose, Sodium, potasium, and albumin, total cholesterol (TC), triglycerides (TG), very low density lipoprotein (VLDL), low density lipoprotein (LDL)-C, high-density lipoprotein (HDL)-C, apolipoprotein A (Apo A), apolipoprotein B, and lipoprotein a were measured. TG ( P = 0018) and VLDL ( P = 0.022) were lower in CAPD group than HD group, HDL-C ( P < 0.001) and Apo A ( P = 0.001) were higher in CAPD group than in HD group. 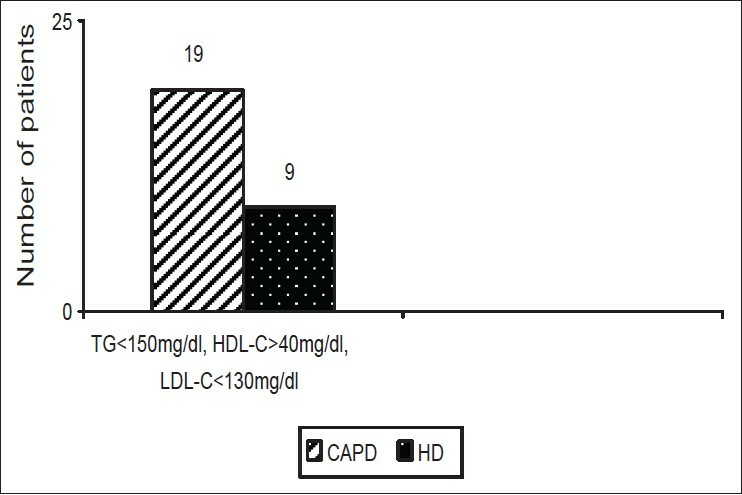 A total of 24.4% in CAPD group and 11.4% in HD group ( P < 0.034) had normal serum levels of TG, LDL-C, and HDL-C. More patients in CAPD group (47.4%) had high serum Apo A levels than in HD group (21.5%) ( P = 0.001). We suggest that patients receiving icodextrin-based CAPD may have better TG, HDL-C, and Apo A levels than patients on HD. Human papillomavirus-driven verruca vulgaris infection is common in solid organ transplant recipients and increases the risk for squamous cell carcinoma. The available treatment modalities have limited response. 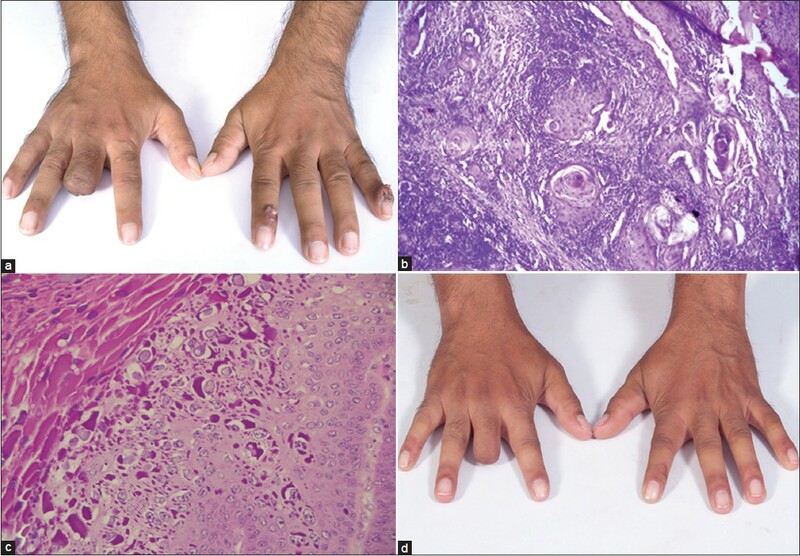 We report a renal allograft recipient who presented with multiple warts not responding to cryotherapy and radiosurgery with one turning malignant, needing amputation of the finger. An extract from Thuja occidentalis (White cedar tree) cured the resistant warts on the other fingers, leaving only superficial scars and without affecting allograft function. We have reviewed the pharmacological and clinical properties of T. occidentalis. 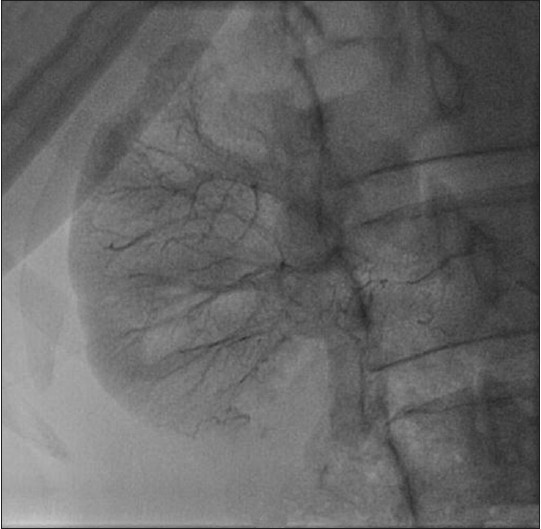 Renal artery stenosis is an important cause of secondary hypertension in young, which can be treated effectively with endovascular interventions including stenting. 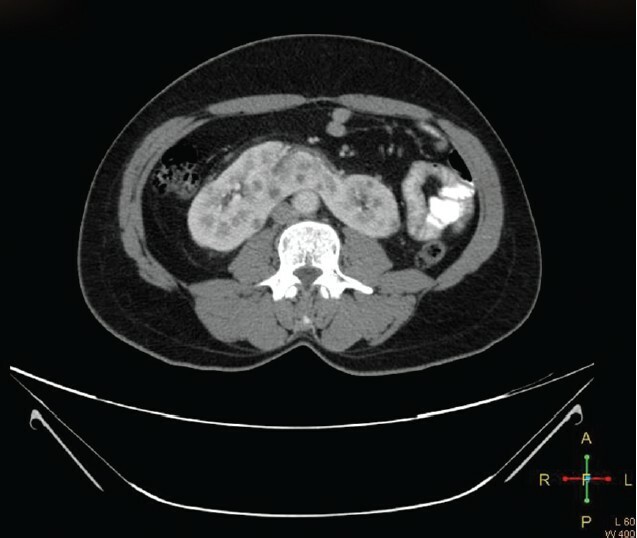 In-stent thrombosis is an infrequent complication and necessitates the need to follow-up these patients with renal artery stents. 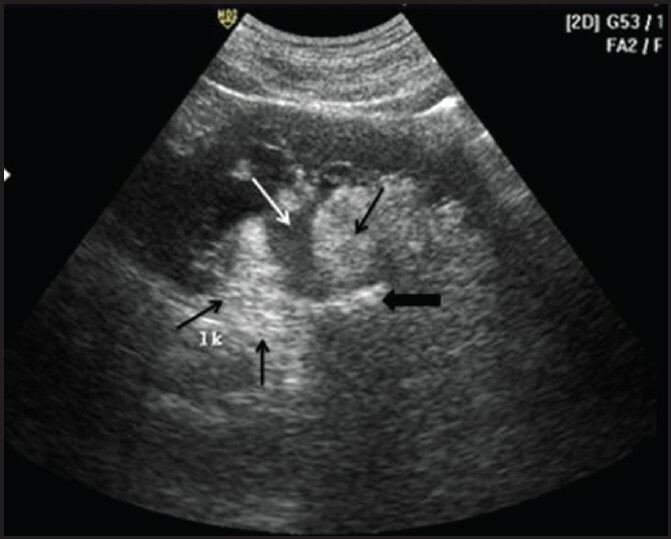 We present here a young individual who presented with in-stent thrombosis in a solitary functioning kidney and was successfully treated with stent-in-stent placement. 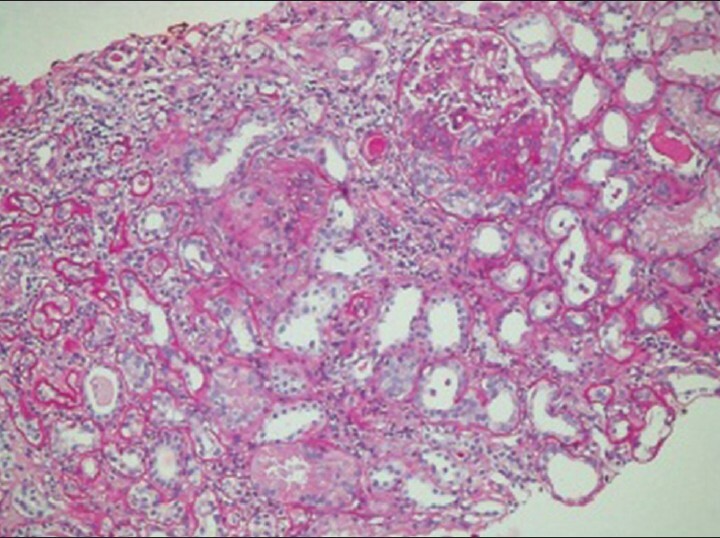 Glomerulonephritis develops in about 20% patients with infective endocarditis (IE), but is mostly asymptomatic. Heavy proteinuria or derangement of kidney functions is uncommon. We report here a child with IE and proliferative glomerulonephritis who manifested as significant proteinuria that recovered on treatment with immunosupressants. Monoclonal immunoglobulin deposition disease (MIDD) is an uncommon disease with a peak incidence between the 5 th and 6 th decades of life. It is characterized by non-fibrillar, Congo red negative deposition of monoclonal immunoglobulins in various organs, including in the kidneys. MIDD can be of three types depending on the composition of the deposits, and includes light chain deposition disease (LCDD), heavy chain deposition disease and light and heavy chain deposition disease, of which LCDD is the most common. 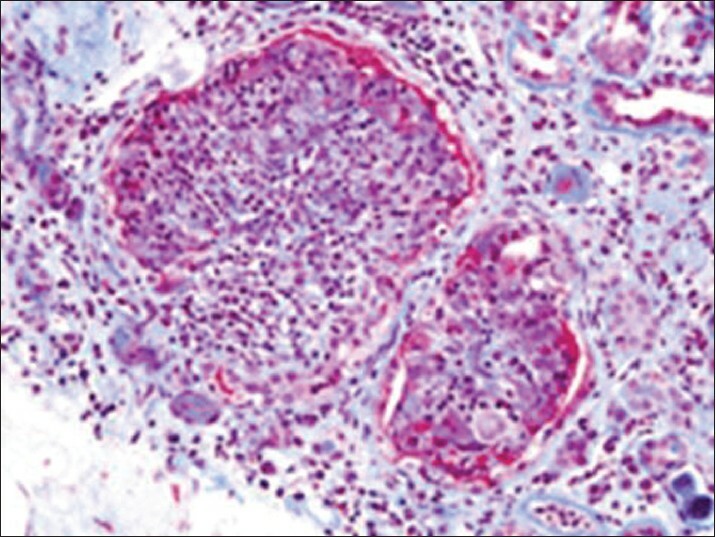 Renal involvement is a universal finding in MIDD, and is in the form of renal insufficiency, microscopic hematuria and nephrotic range proteinuria. Gross hematuria is a rare occurrence. 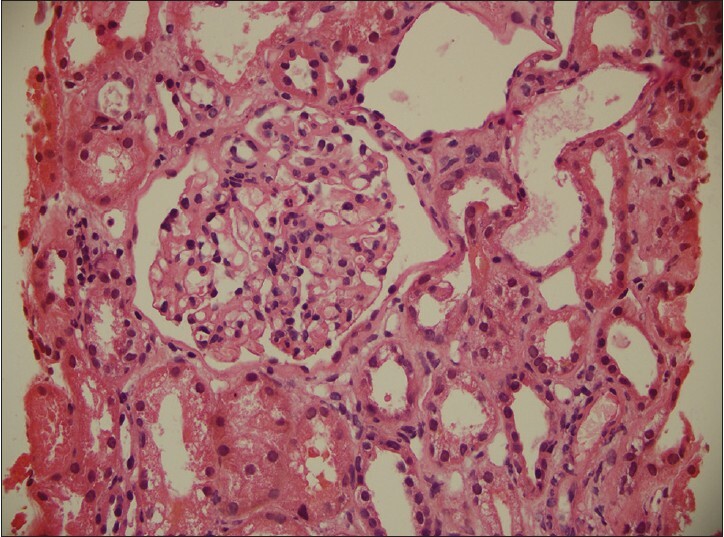 Renal biopsy usually shows nodular sclerosing glomerulopathy on light microscopy and diffuse linear staining of glomerular and tubular basement membrane on immunofluorescence microscopy. 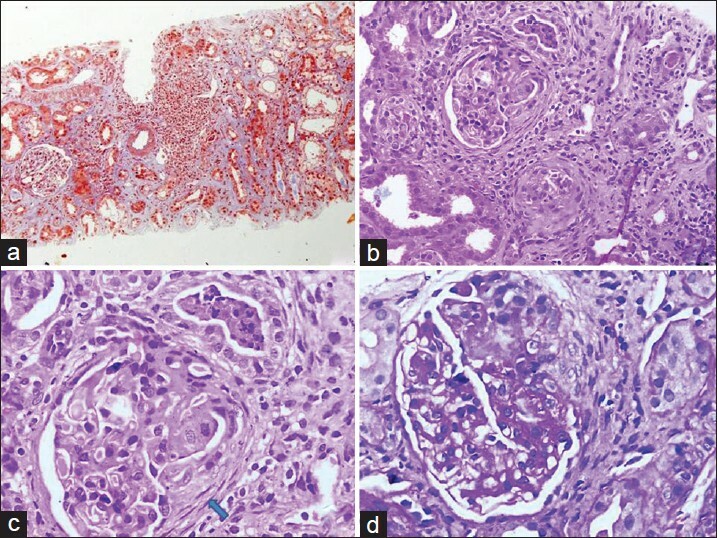 We report a young male who presented with rapidly progressive renal failure and gross hematuria and was diagnosed as LCDD with nodular glomerulopathy and crescents on renal biopsy. Severe hypercalcemia is uncommon in clinical practice and is usually due to primary hperparathyroidism or malignancy. 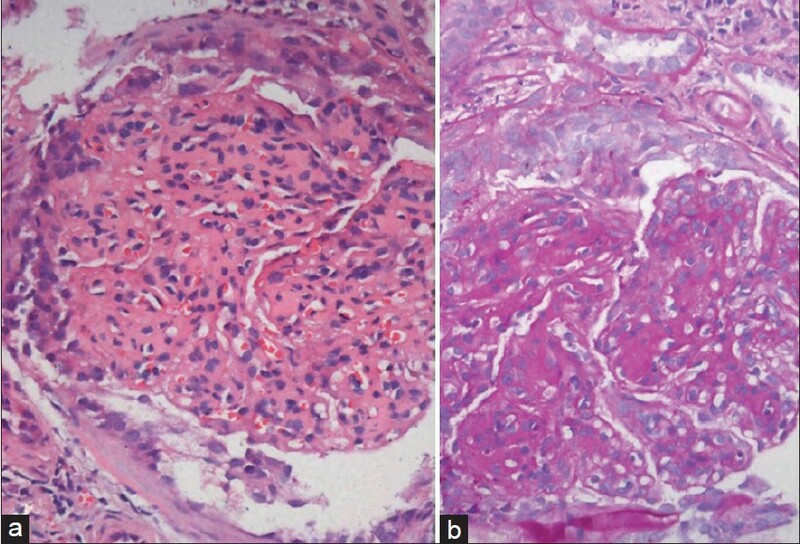 We present a patient who presented with severe hypercalcemia with renal failure; further evaluation of which revealed the diagnosis of sarcoidosis. 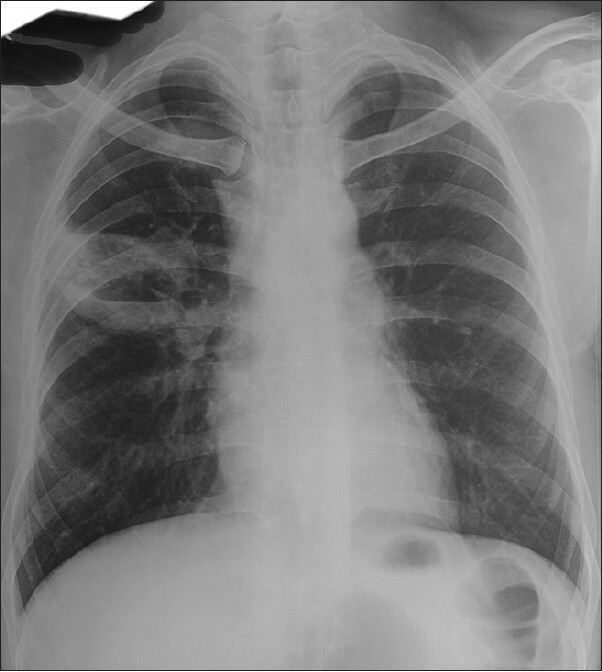 This case is presented in view of the rarity of presentation of sarcoidosis with hypercalcemic crisis. Non-O1, non-O139 Vibrio cholerae is an encapsulated bacterium, ubiquitous in the marine environment and generally considered to be non-pathogenic. However, it is known to cause diarrheal illness, wound infection, and bacteremia in immunocompromised hosts. Here we have describe non-O1, non-O139 V. cholerae sepsis in a patient with nephrotic syndrome following exposure to sea-water. Interestingly, the exposure occurred remotely 4 months prior to the onset of nephrotic syndrome. The occurrence of florid sepsis after a prolonged interval from the time of exposure is peculiar and raises the possibility of an association between occult Vibrio sepsis and nephrotic syndrome. Although lungs are the portal of entry for cryptococcus, pulmonary disease is relatively uncommon. Cavitary pulmonary disease is even less common. 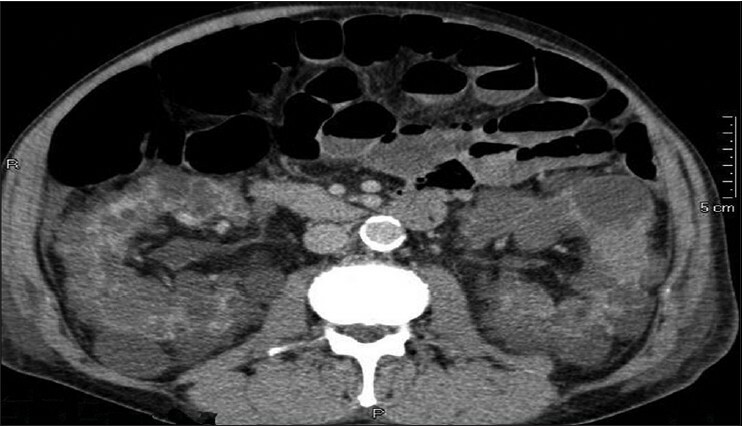 We report a rare case of cryptococcosis with an isolated cavitary lung lesion in a renal allograft recipient. Marijuana is used for psychoactive and recreational purpose. We report a case of fulminant hepatic failure following marijuana drug abuse who recovered following artificial support systems for acute liver failure. There is no published literature of management of marijuana intoxication with molecular adsorbent recirculation system (MARS). MARS is effective and safe in patients with fulminant hepatic failure following marijuana intoxication.